I love making mini albums but have only made a few. When I was cleaning through some of my stuff a few weeks ago I found these pieces of 4x4 chipboard I had cut to make some albums but never got around to doing them so I set the chipboard aside so I could do them when I got stuff back in order. And...offf cccoouurrsseee I didn't make just one, I made 4 *okie is seriously thinking of seeking therapy for this making of multiples sickness she has*. 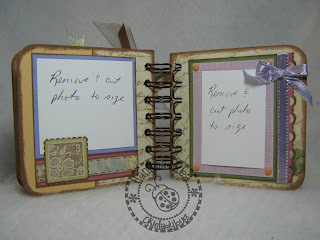 I used a lot of different products on these dang little albums and could have kicked myself for even starting them but once they were done I liked them. 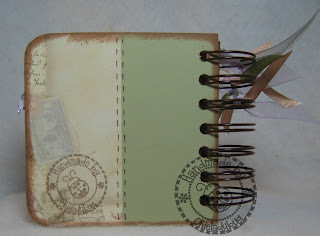 The patterned paper is from K & Co. by Marcella 6x6 paper pad. I used a large pearl brad for the center of the purple flower and then added some other little hot fix blings. 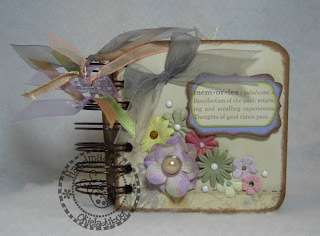 The stamped sentiment is from Stampin Up Define Your Life stamp set. The large butterfly is a Cuttlebug cut and emboss set and the smaller one is the Martha Stewart punch. 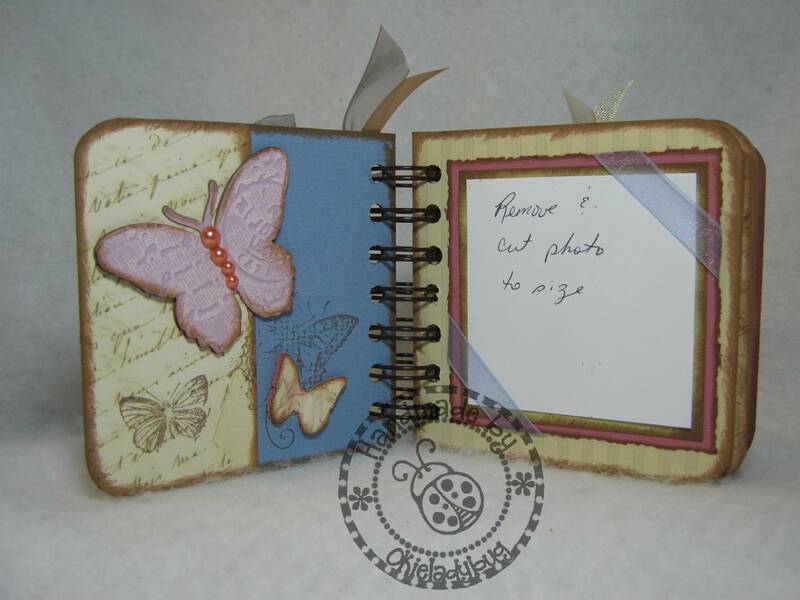 I added a few stamped butterfly's in the background. Where the photos go I cut some white cardstock so the person who has the album can cut the pictures easily to put in place. I used some ribbon on the corners to dress it up a bit. Trying to come up with a different design for each little page was a bit difficult do to the small size and wanting to have enough space for a decent photo. I decided to do a pocket with a tag on the page on the right. 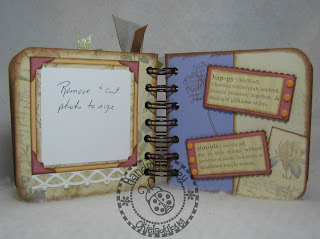 I used a Stampin Up stamp from the Vintage Vogue set on the pocket, added a white border using a Stampin Up border punch. I also added rivets on the corners, they are actually little metal hot fix studs. 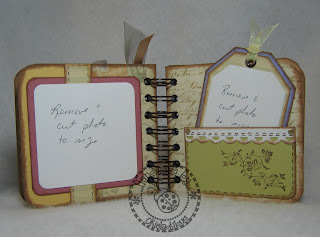 The border on the left page is a Martha Stewart border punch and the photo corners are done with an EK Success punch.The pearls at the bottom are some Imaginisce flat back pearls that are hot fix as well. After taking the picture I noticed I missed one and went back and added it. 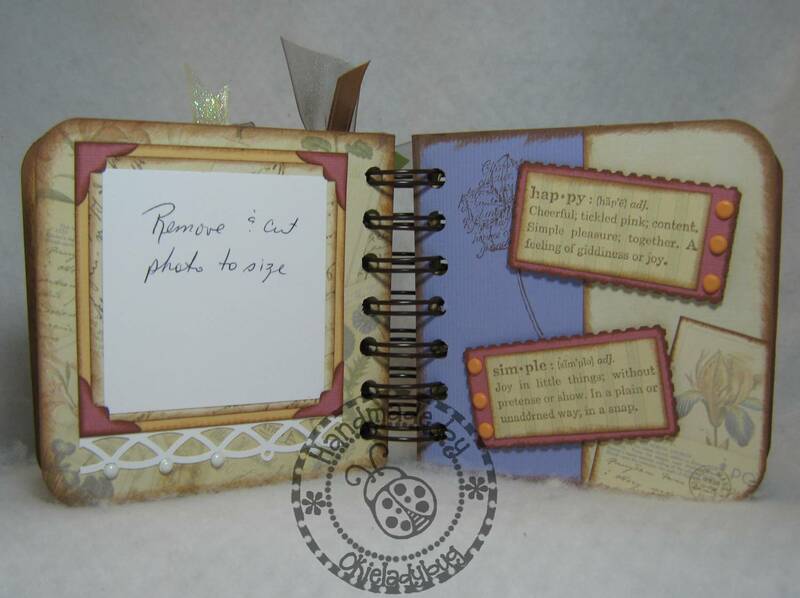 The sentiments on the right page are from the same Define Your Life stamp set as the sentiment at the front of the album. I tried to decorate the page up a little so it wasn't too plain. I got my Purple Cows paper trimmer out for some of the picture mats. I always forget to use that thing! 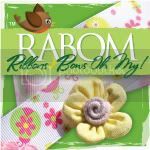 Using the sheer ribbon added some elegance and the photo will still show through. 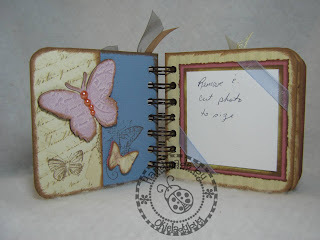 The Sentiment and butterfly on the right hand page are both Stampin Up products. The glitter brads as the flower centers are some I did sometime ago using my heat emboss gun, clear embossing powder and then quickly dipping in glitter. The postage stamp is a Stampin Up product, as is the punched postage stamp background. The object is glued at the bottom but free at the top so a photo can slide behind it just fine. 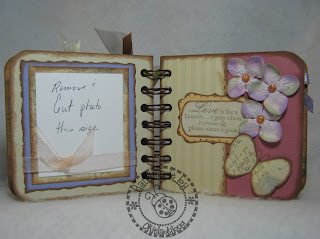 By the time I got to the last page I was running out of ideas and tired of working on these suckers so I just added a border from a Stampin Up border punch, a touch of ribbon and a few brads. I did very little decorating to the back because it isn't something people will see much. I did add my personalized stamp in the bottom corner so no one else can say they did all the dang work and made this sucker! *okie cracks up laughing*. I used my Cinch to punch the holes and then bind the book together with 1.25" wires. I will be selling 3 of these albums if anyone is interested. The price is $25 and includes first class shipping. I accept Paypal if you are interested in purchasing one. 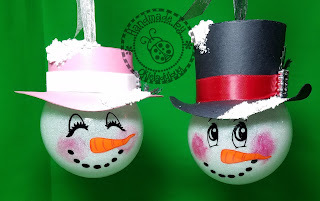 Love these, they are cute and so pretty, too. Beautiful, Okie. Be careful, girl, albums are an addiction. I've actually been reduced to buying a birthday card! Okie this is just so cute! 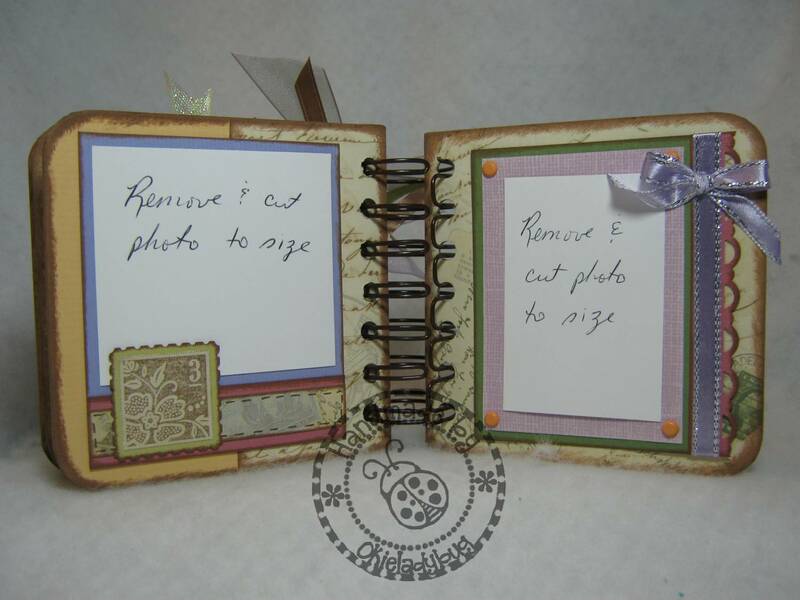 I love mini-albums but have not made but a few and gets me in the mood to make another. My friend makes them all the time and what she ends up doing is tying tulle on the spirals. It looks so great stuffed with color. She just buys the tulle that is found at JoAnns or Hobby Lobby in those little 6" tubes, cuts of about 6" and ties them until it's almost filled. Really cute, and love the colors! 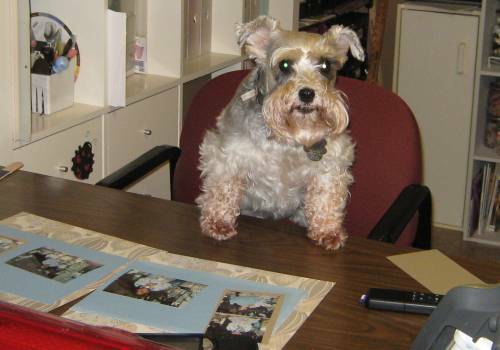 Shirley, I want to order one of these! Beautiful book. I love seeing your projects. Over-achiever! :) lol, I have been known to make multiples too... But, they are so gorgeous, how can you stop at just one? You are so talented.